This year’s challenge lies in addressing your anxieties, and emerging stronger for it. Fortunately, youąve the right attitude to meet merciless schedules and any testing times ahead. If in doubt, talk problems through. Sure, you’d rather rely on just you. That’s Aries’ style. But we can all occasionally do with a helping hand. And this year promises to introduce a special someone who brings new wisdom and wonder into your life. This could be via romance, or friendship. After May 2019 many Ariens are swept up by anotherąs charisma – and feeling emotionally richer for it. Singles expand sexual frontiers. Couples become more risqué. A tad more communicative, too. In September, a jubilant Jupiter pushes professional issues along. Don’t worry if less scrupulous colleagues try to steal your glory. With you already one step ahead, they’ll be firmly booted two steps behind. So business and money matters not only look promising, but suggest a pleasant change in lifestyle. Personal goals suddenly seem clearer and soon come within reach. For a while now Saturn’s been challenging ideals that have previously have acted as a safe anchor. Effectively, you’ve been cast adrift. No wonder you’ve felt lost and alone. Thankfully, the cosmos takes pity and allows Jupiter to retake the helm and navigate you to safety. This marks the end of your solo voyage. With each new day, goals become more defined and less distant. And don’t worry if you occasionally hit troubled waters. As you’ve come to know, the spirit can only grow when challenged. Around September, Venus keeps a steady keel by increasing cash flow. And If wondering where to direct the blessings that Jupiter promises to bring – basically, the choice is yours. One suggestion, why not take a chance on love? After all, here’s a year when your natural charisma is all-but irresistible. Summer and social activities are directly linked, as is romance. Autumn, too, hints at a fulfilling love life, along with a supportive professional network and a potential flourish of finances. Perfect. watch your spending and allow plenty of time to reach goals. If laden with debt, the cosmos sends in sensible Saturn to lend a helping hand. So put any good advice or sudden influxes of cash to good use. And while clearing financial burdens, discard any remnants of self doubt as well. A big ask perhaps, after recent traumas. But you have survived, and emerged immeasurably stronger and wiser. If necessary, send this message out loud and clear. After September, Jupiter cosies down into your bedroom for what could be a luscious, licentious year ahead. But to give relationships a chance, you must be prepared to trust. Sure, youąve been hurt in the past. It is part of life’s learning curve. Now, give someone else the opportunity to know and love that special soul that’s you. 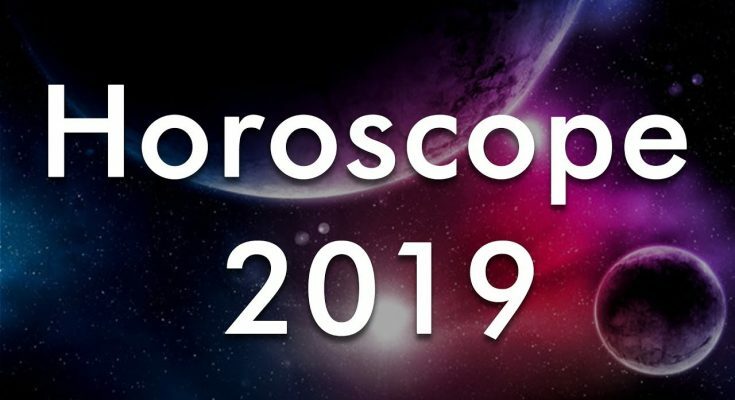 January 2019 kick starts the year with a surge of energy, and Saturns’s still on hand to add determination. Suddenly, going that extra mile won’t seem so daunting. But if around September resources are stretched to the limit, don’t assume the worst. Challenges can often work to your advantage. Use this time to reassess values and abandon outdated ambitions. Perhaps you should consider trying a different line of work. Don’t rule out a trip overseas, either. In matters romantic, the Sun jump starts your libido in January, and you’d be daft not to take advantage. March and April arrange amorous escapades of their own. Or perhaps you’d prefer to wait for June, when Venus merges friendship with love. Don’t worry if these unions don’t last forever. The memories will. September, though, signals the start of a far stronger bond. Meanwhile, established couples enter a make or break period. Why not sway the odds in your favour with cosy getaway for two. Somewhere scantily clad, and very secluded. Leo are ambitious and reliable. You’re fascinated by power, and how people work. Another handy quality: persistence. If already in the public eye, prepare for an even grander leap of fame after September – though it’s important to stay diplomatic. While you may have deliberately avoided confrontation through 2018 – this year, you’re less coy in the company of opposing opinions. Just don’t become too pushy, and you may end up alienating those you need most. Family matters may also bring conflict. Unfortunately, it’s our nearest and dearest who really know which buttons to push. And push them they do. One relative, in particular, could scour Leo nerves red raw. If another chooses to play fast and loose with your finances, a reappraisal of joint money matters may be required. When it comes to love, it looks like a truth or dare kind of year with certain issues needing open discussion. Talking from the heart seems a big dare. But without the truth, you can’t move on. Jupiter moving forward around early May promises almost unlimited potential for personal and professional growth. Of course, we rarely getting something for nothing, so expect to work hard as well. Your best teacher and role model will always be that quiet inner voice that whispers truth and wisdom. We each come into this world with our own unique talents, and our own special tasks to perform. Understand this, and you’ll not only be able to better yourself but also encourage others to achieve their full potential. In turn, your insight will be admired; your generosity, rewarded. Even the occasional moment of adversity can be turned to your advantage. In matters of the heart, 2018 was make or break time – a year in which you strengthened vulnerabilities and reclaimed personal power. This trend continues. Singles have energy to burn and plenty of magical hours to share. Couples can also expect dramatic transformations, with little held back. Seems you’ve a very special year ahead, Virgo. Use it well. It’s been a tough year, my friend. Time and time again, your resolve has been put to the test. But it’s been the betrayal that’s hurt the most. Try to leave it all behind, because that’s pretty much what this year is all about – forgiving and forgetting. 2019 wants you to move on. Free up mind, body and soul for the happier times ahead. Commitments won’t completely disappear, but can be handled in a more relaxed way. The answer lies in staying calm, and knowing that you can be whole within yourself. In matters of love, you’ve struggled with the freedom-v-commitment theme….struggled with loneliness. Let’s face it, you’ve struggled – full stop. Of course, self awareness has grown but that’s little consolation when feeling low. The good news: this long cycle is coming to an end. You will love again – but in a more independent way. More importantly, you’ll not settle for anything less than best. The fun starts after April. Apparently, it’ll be worth the wait. Scorpio minds are on the move, and the shift looks positive. Basically, it comes down to trusting your instincts and quickly acting on them. This could relate to a new job or retraining. And should the occasional obstacle need a determined nudge, you’ve plenty of planetary power behind you. Keep your work load realistic all the same. Stay practical and complete each project before launching into the next. Your wallet should also notice a little weight gain after April. coupled or single, 2019 offers fresh starts. Chances are, you’ll be mixing a little business with lots of pleasure. 2018 was probably not all that you had hoped for. Uncertainty, disruption…upheaval. Bit by bit, they all chipped away at your sense of belonging and self esteem. For a while there, you felt fragmented and out of control. At times, though, it takes such drastic action to force the Sagittarian hand. When you fall into a rut, and refuse to make changes – the cosmos will do it for you. This next year continues to encourage renewal – but this time, with you as a co-contributor. Many outworn attitudes are traded for ideals more relevant to the present. Around late April, we should see a far more outgoing, assertive Sagittarius. Though the idea of more hard work may not instantly appeal, you know when you’re on a roll. Just bear in mind that although you’re generally honest, others could have hidden agendas. Don’t be surprised, too, if there’s mounting tension between personal and professional responsibilities. Prioritise, and make time for play. Every now and then we all come to question our lot, and sometimes we can give life an overwhelming vote of no confidence. If youąve become this disheartened, remember that nothing’s cast in cement. Everything shifts and changes, as 2019 sets out to prove. Saturn grabs the baton in early January, and sets a fast and fun pace. Many Capricorns consider a change of address, or renovations. Mixing business with pleasure also becomes a strong possibility, more so after September. Around the same time, your guardian angel puts in some overtime on your behalf of your career. Actually, it’s more likely you’ve a team of them working around the clock. Finally, you’ve little to lose and much to gain. Consider retraining or working closer to home. There couldn’t be a better time – as a new environment will refresh spirits and boost potential, as well as income. Though not everything can offer immediate rewards, plans put into motion early in 2019 promise plenty of gain by year’s end. Over the past year you’ve been thrown from pillar to post. Mind, body and soul have all felt the force of radical change. Some have been at the brunt end of enforced career changes. Others have witnessed their home life split wide apart. Perhaps you’re to blame, perhaps not. What does it matter? What’s become more apparent, however, is how interdependent we all really are. The days of uncompromising individualism are on the wane, possibly not the best news for stubborn ol’ you. Still, there’s an upside. matters. Uranus offers the unusual when it comes to work. Be ready when September also brings the possibility of travel. And through exploring new territory, you should rediscover your true potential. But your true strength this year lies in knowing that there’s no such thing as overnight success. You become a quiet but mighty achiever. By December’s end you emerge successful and ….almost, debt free. Dismiss any anxieties about the road you’ve chosen to travel. Most of our fears are self inflicted, Pisces. So, in effect, it’s only you preventing yourself from treading your true path. Moods have wavered for a while now – though an energetic overspill from late 2018 should increase momemtum. Complete unfinished business, and you’ll dazzle them all! Don’t be shy in promoting your talents. Sure, there’ll be obstacles – but we’re never given more than we can cope with. In moments of doubt, let instinct steer you in the right direction. Study or retraining could also help put you on back on track. After September 2019, Jupiter fires up your free spirit. You cultivate new contacts, promote self interests and launch into the type of work you were born for. And when everything starts to roll into place, don’t put this down to simple luck or timing. Take some credit here. It’s you that’s become wiser, more assertive….and a tad more discerning. Remember, too – that you’re warmly loved.